Soon I'll be heading to Orlando for one of the special events, Star Wars Weekends. They have announced the line-up and the hosts. Ashley Eckstein, who voices Ahsoka Tano in Star Wars: The Clone Wars and was one of the hosts last year will be returning. I'm very glad to hear this as last year I met Ashley and had the opportunity to interview her on WDW Tiki Room. She's great and I love her clothing line, Her Universe. 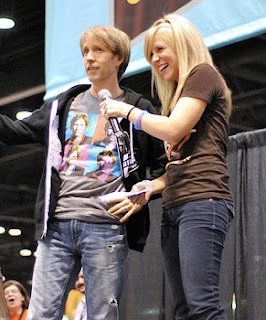 Also hosting this event with Ashley is James Arnold Taylor, the voice of Obi-Wan Kenobi in Star Wars: The Clone Wars. I have to admit that I'm so excited to met him because he sounds just like Ewan McGregor. I'll be attending the first weekend and am looking forward to seeing Dave Filoni again. He was great to meet last year and it will be cool to meet Anthony Daniels. 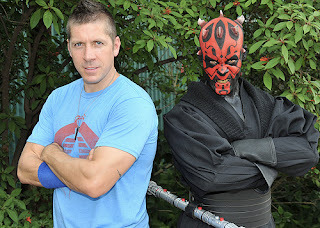 However, I wish I was also attending the 3rd weekend even though I did get to meet Ray Park last year and Jeremy Bulloch was there as well. I'd like to see Ray Park again and get to meet Matt Lanter (who is also on 90210). I will be dressed up in Star Wars attire and can't wait to ride the updated attraction on opening weekend, Star Tours: The Adventure Continues. Our family has been to 3 SW weekends. Can't make it this yr and am bummed! Have a great time. We love meeting the actors, seeing the characters, and dressing up also! Sure wish I could be there to get the great collector pins. They need to have this at Disneyland!